Knowing your numbers is the key to unlocking your future success. 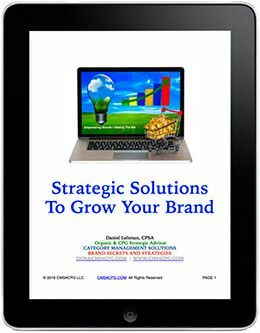 They can determine how long your brand will be around & help you compete at the highest levels. Going beyond canned topline reports will differentiate your brand – what retailers REALLY want. This is also the number-one question I get asked when I mentor or work with brands. I’ve had the privilege of working with literally hundreds of brands in all stages of development, from pre-revenue to multi-billion-dollar companies. Sadly, most brands use reports that do not reflect how customers buy their products, even the big brands. This is an expensive and huge waste of money. You’ve probably been told that bringing top-line canned reports to your retail appointments is critical to your success. The reality is that most top-line canned reports are simply a waste of ink and paper. Sounds like a pretty harsh statement? Let me explain. 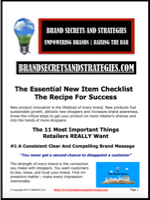 Savvy retailers already know how your brand is performing on their shelves. They do not need a report confirming what they already know. They do not need a report telling them the exact same thing that every other brand is telling them, only with your unique spin. What they really need are actionable insights that they do not have access to on their own. They need actionable insights that your competitors are not providing them. Retailers also need you to help them compete more effectively in their markets. Every retailer needs to know that if they put your product on their shelves that it will grow category sales and increase shopper traffic in their stores. Once that happens, you then need to validate and reinforce that your brand deserves to remain on their shelves because it continues to achieve those results. Before I go any further, I want to remind you that there’s a free downloadable guide for you at the end of most every podcast episode. I always try to include one easy to download, quick to digest strategy that you can instantly adopt and make your own, one that you can use to grow sustainable sales and compete more effectively. 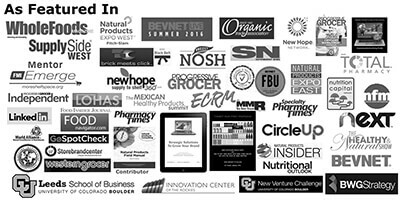 Remember, the goal here is to get your product onto more retailer’s shelves and into the hands of more shoppers. If you like the podcast, please subscribe, share with a friend and leave a review. Retailers want insights, actionable insights. The most effective way to do that is with sales data, fact-based selling. Most selling is what I would call relationship selling, using what I would call the push method. This is the strategy that most every brand adopts because they simply don’t know any better. With the push method, your checkbook is the most important tool in your arsenal. With this strategy, you’re more likely to get onto a retailer’s shelf if they have a relationship with you and if your pockets are deep enough.